The Brown Company, known as the Brown Corporation in Canada, was a pulp and papermaking company based in Berlin, New Hampshire, United States. They closed their doors during the 1980s. In 1852, a group of Portland, Maine, businessmen, John B. Brown, Josiah S. Little, Nathan Winslow, and Hezekiah Winslow, purchased and built a large sawmill on the property known as the "Thomas Green Privilege" at the head of Berlin Falls in Berlin, New Hampshire. In 1854, they expanded their operations by constructing the H. Winslow & Company branch railway to the Grand Trunk Railway, and, in 1858, they built a dam and a gristmill. By 1866, John Little had died, and the Winslows had sold their interests in the H. Winslow & Company. A new partnership was formed and a new name chosen, the Berlin Mills Company. In 1868, William Wentworth Brown and Lewis T. Brown purchased a controlling interest in the company and remodeled their sawmill, making it even larger than before. W. W. Brown later purchased the stock owned by Lewis T. Brown in the 1880s, acquiring complete control of the company. The company changed its name again in 1917 during World War I to the Brown Company. The Brown family owned land that spanned from Canada to Florida, which they used for logging. In the 1940s the Brown Company went through bankruptcy and never recovered. In 1954, European business began to purchase large amounts of stock in the company, therefore the Brown Company began to buy European businesses in England, Wales, and Italy. The closing of the company came in the 1980s, when the Brown Company was bought out by the James River Corporation. The paper mills stayed in Berlin under various companies until closing in 2006. The other plant in Gorham is now operated under the name of Gorham Paper and Tissue, which is managed by Patriarch Partners. In the 1970s, Bill Taylor, associate professor of history at Plymouth State University, arranged for 11,000 photographs taken by the Brown Company photographers from 1870–1965 to be transferred to the said university for archival usage. In 2006, images were scanned, and the Beyond Brown Paper website was formed. In September 2012, a partnership between Historic New England, the Berlin and Coos County Historical Society, Timberlane Regional High School, and Plymouth State University created an award-winning documentary called At the River’s Edge: An Oral History of Berlin, New Hampshire. During the early 1900s, the Brown Company created a new department known as "research and development" and constructed a building for this to take place. In 1954, over 150 projects were kept recorded in their books. The objective for this new department was to "demonstrate that the future of the Brown Company didn't lie in the achievements of the past, but in the development of products and process that were yet to come." Some products that were the result of the R&D department were Bermico piping, cellulose floc, and Nibroc towels. In January 1927, work began in the Everglades in Florida by Dr. R.V. Allison to work on soil problems and to reclaim lands that were taken by two railroads. At its peak, the Brown Company's R&D department held over 100 scientists and eventually earned 600 U.S. patents. ^ Raymond L. Daigle. Berlin Mills on the Androscoggin, Smith & Town Printers, 2013. 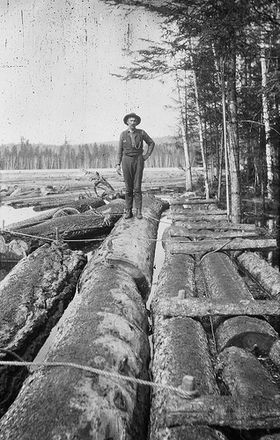 ^ History of the lumber industry of America. Retrieved April 5, 2012. ^ "Berlin History". Archived from the original on November 9, 2012. Retrieved July 14, 2012. ^ "Gorham Paper and Tissue". Retrieved July 14, 2012. ^ "About Beyond Brown Paper". Retrieved July 14, 2012. ^ "Berlin and Coos County Historical Society". Retrieved July 14, 2012. ^ Jon C. Schladweiler. "Coal Tar Impregnated Wood Fibre Pipe". Retrieved November 3, 2011. ^ "Cellulose floc granules and process". Retrieved November 5, 2011. ^ Walter W. Jacob (September 2004). "Stanley Advertising and Imprinted Tape Rules". The Chronicle of the Early American Industries Association. Retrieved August 9, 2011. ^ Jackson & List (2007). "Giants of the Past: The Battle Over Hydrogenation (1903–1920)", Inform 18. This page was last edited on 23 June 2018, at 19:15 (UTC).